Adela Hernandez Gonzmart – “The Queen of Ybor City” –served as the gracious and elegant figurehead and supreme hostess of the world-famous Columbia Restaurant in Ybor City until her death in 2001 at 81. Adela was also a tireless advocate for the arts, the community and her heritage. 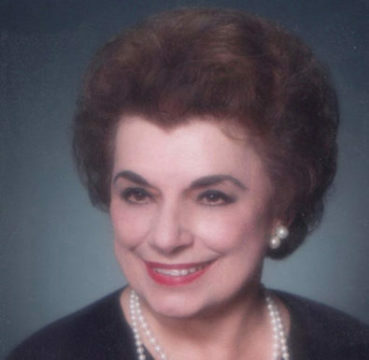 During her lifetime and even after her death, Adela inspired generations of women whose horizons were expanded through her examples of balancing family and business. Adela has many legacies, but one of the more notable is co-founding the Latino Scholarship Fund at the University of South Florida, which assists academically excellent but financially challenged students. She served on the organizational board and was instrumental in forming the Tampa Symphony Orchestra, forerunner of today’s Florida Orchestra. She organized the Ballet Folklorico of Ybor City, and was involved with groups such as Community Concerts, The Tampa Ballet Sociedad Teatral de Tampa and the Ybor City Museum. She also served three consecutive terms as the President of the Ybor City Chamber of Commerce. The national magazine Vista celebrated her as one of 13 Hispanic women in the United States recognized for accomplishments and community service. With her success, she defied expectations, tradition and culture.